On superstar Rajinikanth joining politics, BJP's Amit Shah said "all good people are welcome"
Actor Rajinikanth said he will join politics "if God wills it"
After Rajinikanth's less than direct confirmation that he is contemplating a career in politics, BJP chief Amit Shah's oblique welcome to the mega star is all the buzz. Only Rajninikanth can decide when he will enter politics, Mr Shah said at an event organised by India Today TV on Sunday, but added that "all good people are welcome to join politics." He was asked to comment on the immense speculation around a new career for the star ever since he made several broad hints while interacting with fans in Chennai last week, the last almost a vote appeal. "I will call you when there's a war. You come then," the 67-year-old told his adoring fans who have been pressuring him to join politics. The actor, who belongs to Karnataka, also asserted that he is "a pure Tamil, you have made me a Tamil." On Monday, he had fired a frenzy by saying that he has no political aspirations, but "If God wills it, I will enter politics tomorrow." To the BJP's swift invitation to join the party, he offered no comments. But he did not say no. 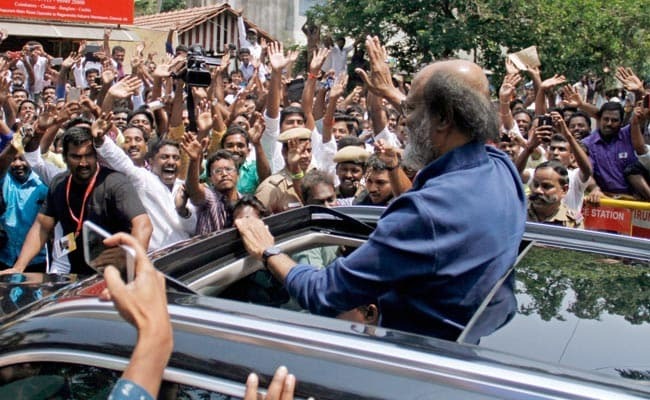 BJP leaders in Tamil Nadu claim that Rajinikanth is a natural fit in their party. The actor's praise for DMK leader MK Stalin last week was frowned upon by the BJP. Sources in the state unit say he was ideologically aligned with the BJP and is a natural ally. On record BJP state president said " if he joins the party, it will be strengthened". The BJP, which has so far been a bit player in a state dominated by regional giants, is looking to quickly expand its influence by filling a political vaccuum created by the death of former chief minister J Jayalalithaa of the AIADMK last DEcember and the illness that has brought 94-year-old DMK chief and Mr Stalin's father M Karunanidhi to retirement. "I am not aware of any possible meeting between Rajinikanth and Narendra Modi," said union minister Venkaiah Naidu in Bengaluru yesterday, on reports that the two could meet this week. Mr Naidu added, "Rajnikanth is a great actor. Narendra Modi is a great leader. There is no problem if he (Rajnikanth) wants to meet the Prime Minister." The actor has earlier praised the Prime Minister, who had three years ago visited Rajinikanth's Poes Garden residence on a trip to Chennai. Meanwhile, security has been tightened at Chennai home of the superstar after threat by fringe group protesting his comments on politics.